Hay says the 6-bay bodies are “much easier” to work from with hand trucks and forklifts. 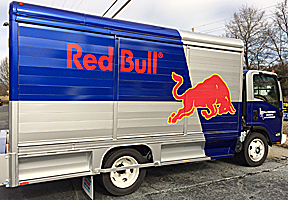 In 1997, Red Bull entered the U.S. market and virtually created the Energy Drink category amid a beverage landscape jam packed with big branded sodas, bottled waters in countless sparkling and still varieties, and a bevy of New Age drinks that lumped together the likes of juices, teas, nectars and anything else new to Main Street and outside of the main stream. Red Bull carved out its sizeable niche on the strength of a single SKU, which quickly became nationally recognizable by its tall and slim blue-silver can, delivered to retailers up and down the street in an equally recognizable blue-silver 4-bay “mini-body.” But over the next 17 years, the Red Bull label was added to a sugar-free version; a zero calorie/zero carb version; and Red, Silver and Blue Editions (cranberry, lime and blueberry flavors, respectively). In addition, the brand expanded its packaging from its original 8.4oz can to 12, 16 and 20oz sizes. All told, Red Bull today has 25 different SKUs and is sold in 165 countries. In fact, the prolific growth of the Red Bull franchise is even starting to push the limits of the familiar blue-silver 4-bay mini-bodies. The SKU expansion combined with the aging of his fleet had Hay staring at a sizeable investment in new equipment. Instead of stretching his finances, he decided to stretch some of his 4-bay bodies into full-fledged 6-bay units, for about half the cost of new. The idea came to light after a series of conversations with Kyle McLaughlin, National Accounts Manager for Mickey’s Reconditioning/Service Team.